Mechanical properties of steel grades have been used for decades to determine their capacity for forming, structural utilization, in-service performance and part life. 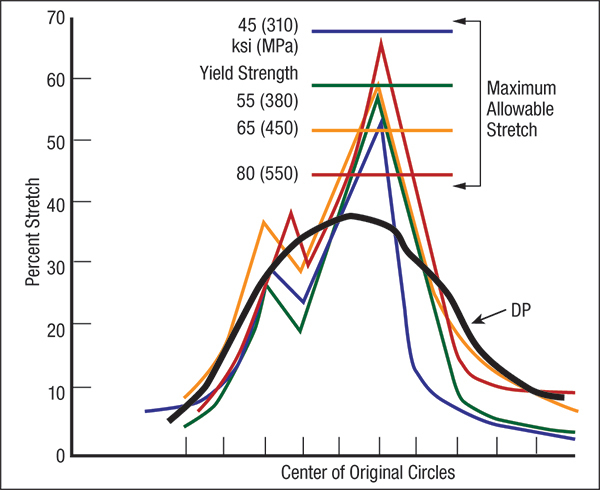 The most common properties, obtained from a tensile test, are yield strength (YS), ultimate tensile strength (UTS), uniform elongation (UE) and total elongation (TE). Previous research has been focused on improving the consistency of these properties through improved steelmaking and processing. During the late 1930s, researchers discovered that the rate of work hardening (n-value) contributed significantly to the stretching capacity of steel. During the ’50s and ’60s, research documented the broad impact of work hardening on metalforming. Many in the metalforming industry now consider n-value as a very important tensile-test property. Fig. 1—1a: Lower n-value increases the strain gradient and lowers the stretchability ceiling. 1b: DP steels only restrains the growth of strain gradients. 1c: TRIP steels can significantly reduce or prevent gradient growth and greatly raise the deformation ceiling. 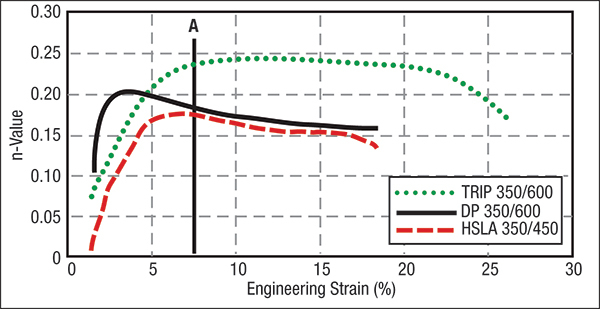 Work hardening is measured from the tensile-test stress-strain curve for the elongation range of 10 to 20 percent, or more accurately from 10 percent to load maximum (uniform elongation). The n-value is derived from the slope of log true stress plotted against log true strain for the power law stress-strain equation. For most traditional low-carbon low- and high-strength steels, n-value for a given coil remains constant during deformation. However, metallurgical processes used to increase the yield strength of a steel coil also cause n-value to decrease. The tradeoff for increased strength: reduced stretchability. Fig. 2—A DP steel (solid line) only has a burst of early n-values, while a TRIP steel (dotted line) shows a continuously high n-value over the entire deformation range. The n-value affects stretchability in two s. First, a high n-value restrains the onset of a localized strain gradient (Fig. 1a). The area first contacted by the punch (character lines, embossments, bends) generates high local stresses that initiate local deformation, causing the steel to work-harden and thin. If the amount of work hardening is small for each increment of deformation, the local gradient continues to grow to high levels of strain and potential failure. For each incremental increase in n-value, the amount of work hardening of deformation increases, slowing the growth of the gradients. Sufficiently high n-values can prevent the initiation of the strain gradient. Second, the forming limit curve (FLC) predicts the maximum allowable strains. The height of this curve is directly proportional to the n-value (Fig. 1a). For most low-carbon steels, the decrease in n-value with increasing yield strength causes a decrease in the allowable stretch. As seen in Fig. 1a, this double response to lower n-values can rapidly cause failure at the gradient site. Most traditional low-carbon higher-strength steels are an alloy of iron and carbon with a single-phase microstructure of ferrite. In contrast, advanced high-strength steels (AHSS) have a microstructure with phases other than ferrite. Examples include dual-phase (DP) and transformation-induced plasticity (TRIP) steels. Their design goal is increased stretchability, total elongation and energy absorption for a fixed yield or tensile strength, making them more formable. About 10 percent of the microstructure of DP steels comprises small islands of very hard martensite that locally increase the n-value. When deformation begins, n-value is not constant; it increases and then decreases during initial straining (Fig. 2). The DP steel (solid line) has a higher n-value than the traditional high-strength low-alloy (HSLA) steel (dashed line) over a strain range from 2 to 7 percent. The traditional n-value measurement range (10 percent to load maximum) would not detect this early increase in n-value. The DP and HSLA steels have the same n-values. Fig. 3—Case study on a steel front bumper (1977) shows how a DP steel prevents the formation of two localized strain gradients. To measure n-value for AHSS steels, the instantaneous n-values must be measured and plotted for analysis. The FLC depends on the terminal or high-strain n-value. Again, the terminal n-values (far right) are the same and laboratory testing has shown that the FLCs of the 350-MPa HSLA and 350-MPa DP steel are identical. Therefore, DP steels only have the advantage of restraining the formation of localized strain gradients (Fig. 1b). However, even this can be an important advantage for parts where severe gradients cause failure or undesirable matching thickness reductions (Fig. 3). Metallurgists have decided that if one set of martensite islands proved beneficial, creating more islands as deformation continues could be even better. Enter TRIP steels, which have a microstructure with numerous different phases. One phase, called retained austenite, provides a continuous source of martensite islands. While the initial n-value of a TRIP steel is slightly lower than that for DP steel, the TRIP steel soon creates n-values much higher than HSLA and DP steels (Fig. 2). The n-values reach nearly 0.25, which is the low side for vacuum-degassed interstitial-free (VDIF) steels, which provide more stretchability than common aluminum-killed draw-quality (AKDQ) steels. TRIP steels also provide a higher FLC (Fig. 1c) and increased total elongation. An analogy for DP- and TRIP-steel n-values is a paycheck. DP steel is comparable to a one-time bonus check (initial higher n-value) used to pay for crushing holiday bills (strain gradients). Thereafter, each month the paycheck remains the same as it was the previous year—no extra money (higher n-values). TRIP steel is analogous to a pay raise (higher n-values) that provides extra income every month of the year, to be used for a wide range of expenses (deformation).